Sugar: 2¢ Makes Sense button. Make Big Sugar Pay button. Boycott Non UFW Grapes, United Farm Workers of America logo button. No Lettuce Unless It’s Union Label, United Farm Workers of America logo button. 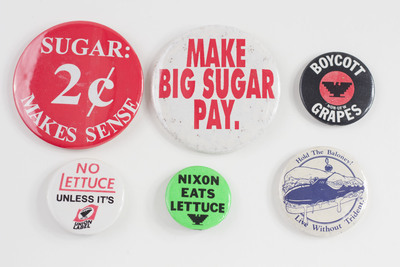 Nixon Eats Lettuce, United Farm Workers of America logo button. Hold the Baloney! Live Without Trident button.